This topic contains 10 replies, has 2 voices, and was last updated by towhid 3 years, 8 months ago. The new updates seem to have more problems than the earlier version, below are some of the issues I encounter. Please note that this is a clean install using the original Dokan theme. 1. When user is not login the shipping is free but the seller have well set a default shipping port. 2. Also, the store page – single product page… becomes non responsive in mobile devices again! 3. Shop banner horizontal repeat and don't display well. Given the issues above, the system is totally worthless. Please fix it asap. 1. I am not clear this question. 2. You have posted into another topic which we are discussing. I did not get any fault while on browsing the site. Whatever, I will provide you continuous support until I fix the issue. 3. The default banner size is the placeholder for the information (address, rating, social, phone number, email) inside it. When the information is too long then the banner just repeat itself to accommodate the extra space. You can use the taller banner to see. 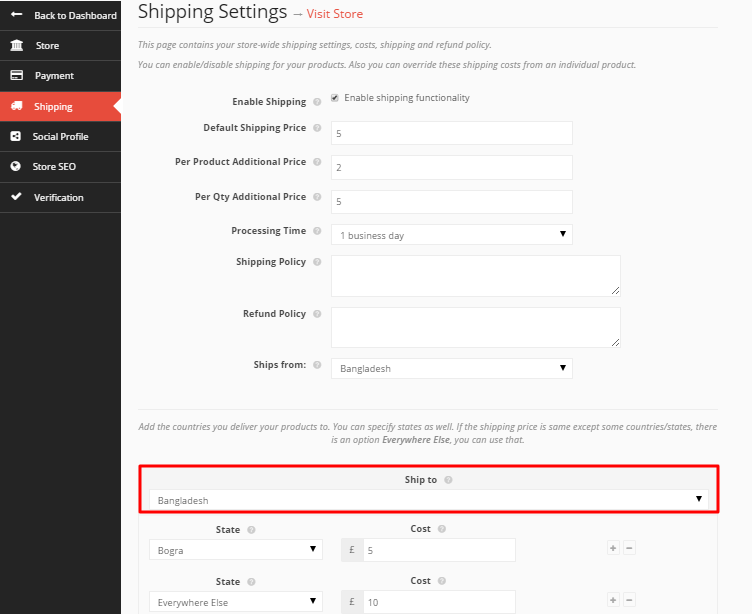 PROBLEM A / Using Dokan Shipping – If a person adds a product to his basket without being connected to the site as user then the shipping costs are marked as free. PROBLEM B / Using Woocommerce shipping – In the administration I configure woo commerce shipping conditions “Flat rate” and add different classes of delivery. However, when the seller disables Dokan postage to use woocommerce parametrized shipping classes . PROBLEM C / I need to automatically calculate shipping value by global weight of the order – Product A = 1kg Product B = 2 KG -> Total order is 3 kg = X shipping value. Is it possible or not. Any solution for PROBLEM C ? Is there a way to allow seller to configure per weigt and per country shipping or not ? I have to reproduce this issue. Please allow me sometimes. I will check this issue after completing all of my works. Ok I wait but please don't forget me 🙂 because now I can't use dokan shipping for my vendors and they are not happy with this ! I have examined this issue and come to a point that the requirement you have specified is not possible right now. We do not have this kind of feature to allow the seller to configure per weight shipping. Ok I know this. But you Know here in Europe, when a seller sold for exemple 3 product in a single time he need to calculate the ship cost by command global weight. Because a customer will not payd for 3 ports in a single command. You understand the problem ? I will let seller manage there own port and waight for an update wich allow seller to manage weight and country shipping from the seller dashboard. I am really sorry to say that we do not have this kind of feature right now. The topic ‘Problem with new update’ is closed to new replies.